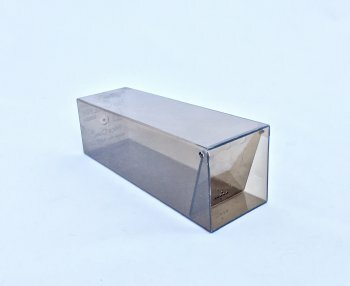 The Mouse Cube is a humane, reusable mouse trap that works by trapping, not harming mice. Each 4-Pack of Mice Cubes contains four re-usable individual traps for those pesky mice who simply refuse to leave no matter what you do. These great little traps do no harm to mice. Just bait a mouse cube with our mouse bait (sold separately) or a little peanut butter and they walk right in through the one-way door for a taste. Once they're inside, just pick up the trap (you don't have to touch the mouse), jump in your car and drive the mouse to its new home. Note: Be sure to check the mouse cubes twice a day (so any trapped mice don't become overheated). ****Customer Comment: "We received these products a few days ago and I am happy to say that on the first night we caught around 12 mice (the first few hours, we were checking the cubes often and setting the mice loose at another location every 30 minutes or so)! I am extremely impressed with this item and I would like to thank you for making it available, as I had no desire to use anything that would harm or kill the mice." To read more about how to get rid of mice, click on Humane Mouse Control Information. Review: I read about mouse cubes online. Inexpensive, easy to use, easy to release mouse unharmed outside. Highly recommend. "Easy to find non-kill method for mice...this is our 2nd order of traps." Review: We live in the country. My husband's car was infested by mice since he brings deer and bird food in his car. Car count was over 50 caught/ 3-car garage 35!!!!!!!!!!!!!!!!! 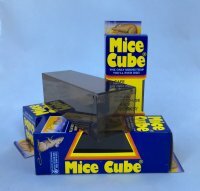 "Mouse Cube (4-Pack) The Humane Mouse Trap"
Review: Very cool products, I have recommended this company to my family and friends. "I Love These and I Think the Mice Do Too"